The kids and I went on a recent extended field trip to the Washington DC area. 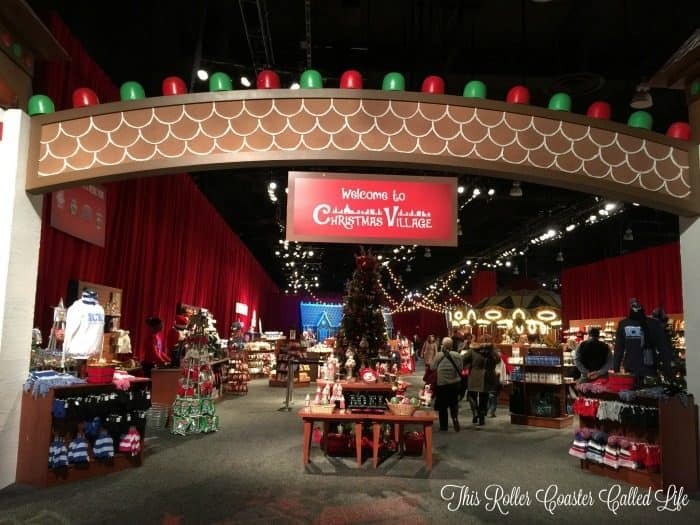 The Washington DC area is a great options for lots of fun educational places to visit that make learning seem more exciting and less painful! 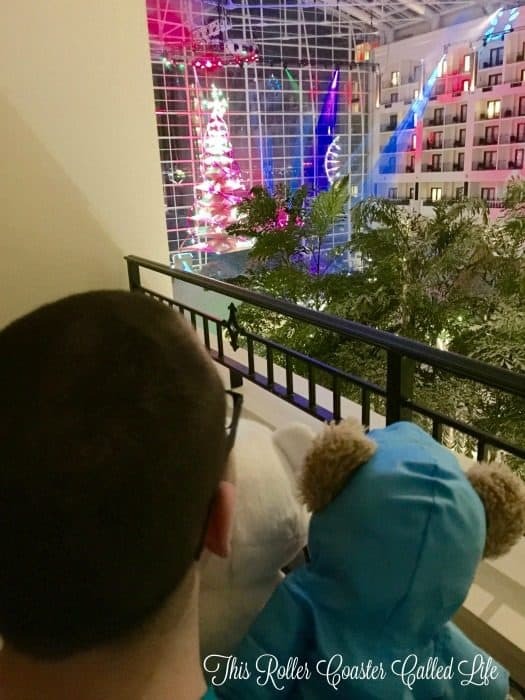 The last stop on our trip was the Gaylord National Resort & Convention Center to see the “Christmas on the Potomac” festivities. First, I must say that my family and I were given free lodging and admittance to ICE! in exchange for sharing our experience on the blog. That being said, our opinions are 100% ours. Now, on to “Christmas on the Potomac”! After we got our suitcases settled and our winter wear together, we ran down to grab a bite to eat for lunch before heading over to experience ICE! 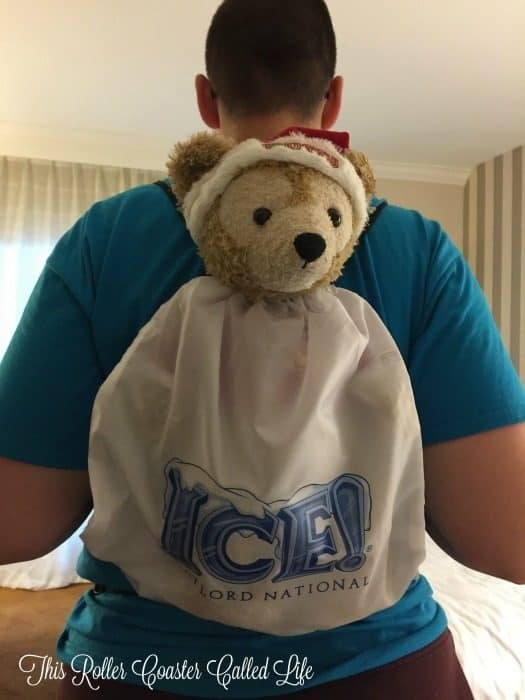 Duffy was ready to see ICE!, too. Since we already had our tickets to ICE!, we headed directly to the Christmas Village. 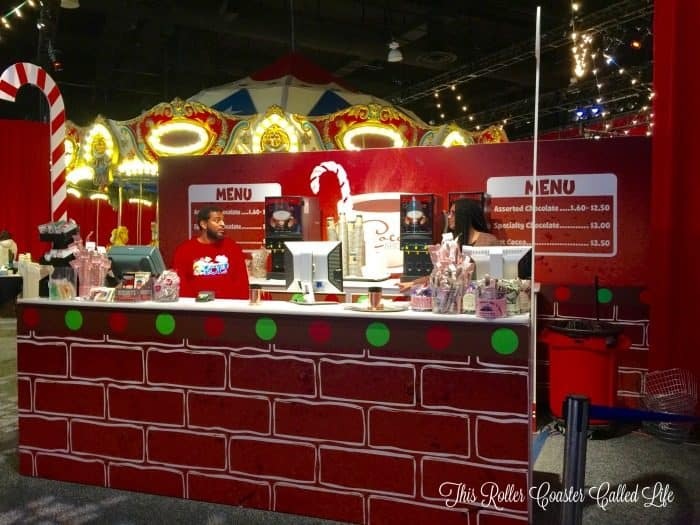 The Christmas Village is really the center of Christmas at Gaylord National Resort & Convention Center. Yes, it does contain shopping and ICE! branded shirts, earmuffs, and other souvenirs. However, it also contains other fun activities that I’ll get to shortly. For right now, we are on a mission. Well, actually, Marvel Boy is on a mission. 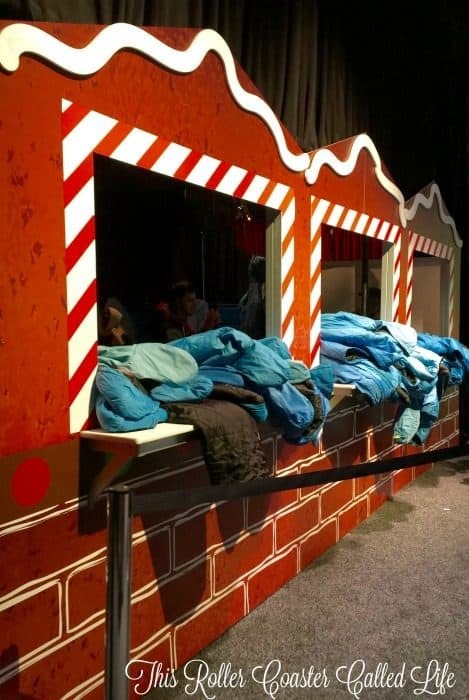 See, Christmas Village contains a Build-A-Bear Workshop. Marvel Boy was looking for a new friend of the Star Wars variety. He did find a Star Wars bear that he wanted to buy, but he decided to wait until after seeing ICE! to get it. 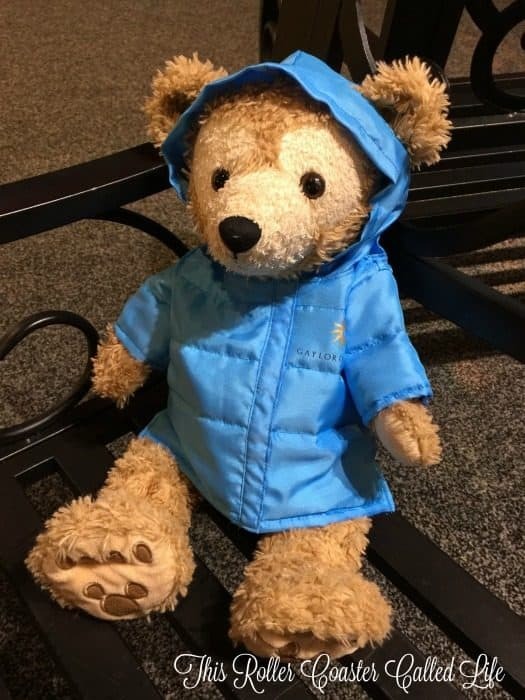 In the meantime, he decided that Duffy needed to be outfitted with a blue parka in order to stay warm in ICE! We headed over to the entrance to ICE! and saw a short film on the making of the ICE! exhibit. It is absolutely amazing how all of this is made! If I remember correctly, it takes 195,000 gallons of water to make ICE! Just staggering! Blue parkas refer to the coats that are worn into ICE! A couple of years ago, we saw ICE! in Florida. We lived in Pennsylvania and felt that our coats would be just fine to wear into ICE! I am here to tell you… Take the blue parka. I don’t know who makes these blue parkas, but they really do keep you warmer than most winter coats, at least winter coats that I have owned. Plus, the parkas are long. It is 9 degrees in ICE!, and the blue parkas seem like they were designed just for this type of attraction. So, we all put on our blue parkas, took a photo, and made sure that our ear muffs were in place and our gloves were on. Then, we headed into the cold! It is truly amazing to see all the detail that goes into making ICE! It is so hard to believe that this all started as blocks of ice and became something so vibrant and beautiful! 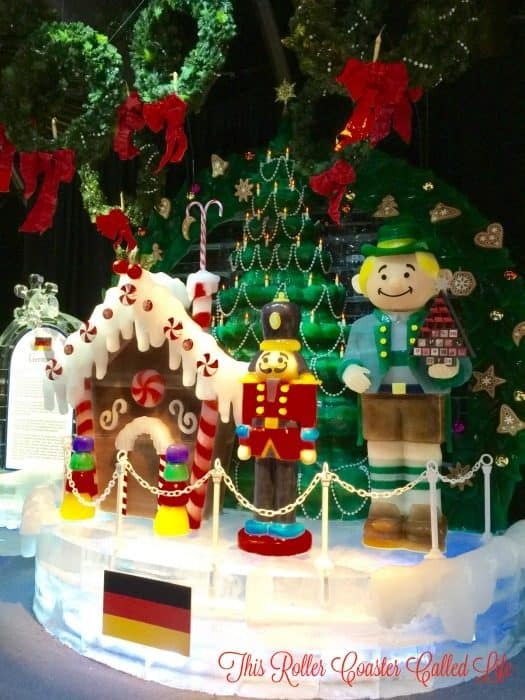 Each Gaylord hotel has its own theme for ICE! 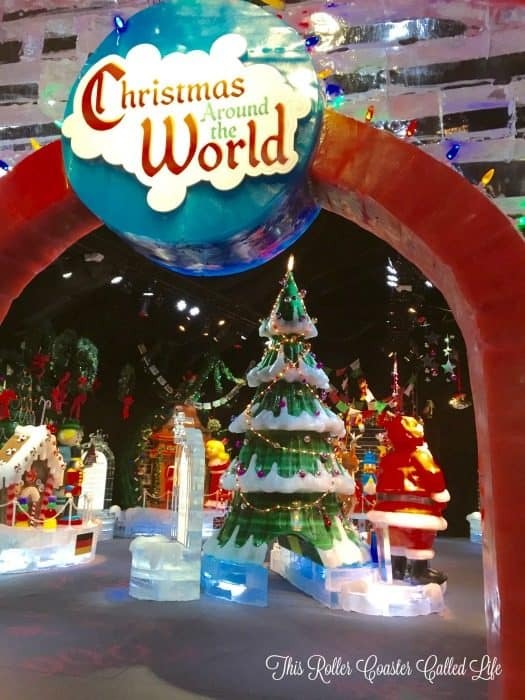 each year, so conceivably, a person could go to each Gaylord and see a different ICE! 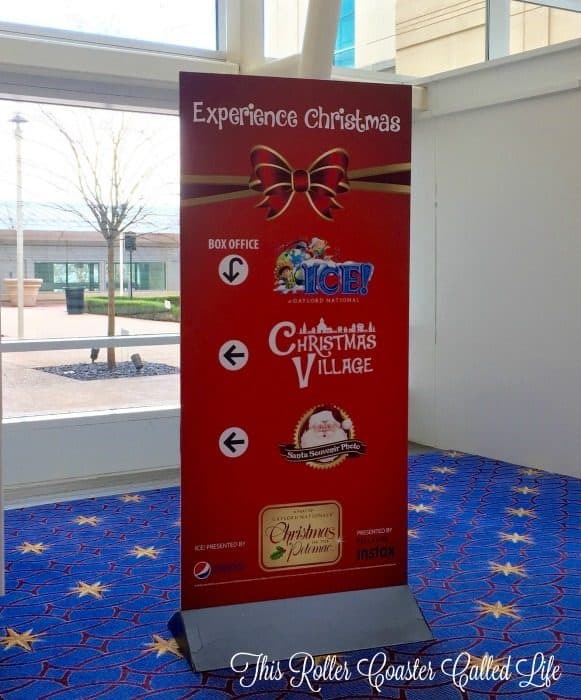 The theme at the Gaylord National Resort & Convention Center this year is “Christmas Around the World”. I think it is so fitting that this scene from Germany is in ICE! because it seems like so many of the things we associate with Christmas come from Germany, like the Christmas tree, gingerbread, and Advent calendars. 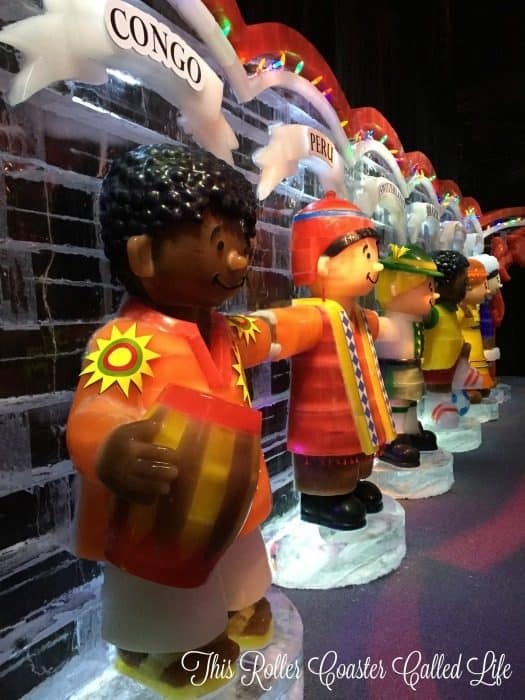 There are also ice sculptures of children from various countries all over the world. The detail is just amazing! Can you believe they make all of this from ice? At the end of ICE! are a few religious sculptures that have such an understated beauty! I love how the lights alternate through the sculptures. Isn’t the life-size Nativity beautiful? Again, the detail is stunning! Seeing ICE! was a beautiful experience, but it was nice to come back into the warmth and see a hot chocolate stand waiting with liquid warmth to warm us up from the inside out. I immediately bought three cups, and we went to sit down for a few minutes and decide what to do next. After sitting for a few minutes in sight of the Build-A-Bear Workshop, my son decided it was time to get his new friend and bought the stormtrooper bear. We also stopped at the Gingerbread Decorating Corner to decorate some cookies. This was a nice quiet spot to kind of get away from all the noise and other activities. It was a great place to relax before heading on to another activity. Earlier in the post, I mentioned how great the balcony is. Here is where the balcony really comes into play. 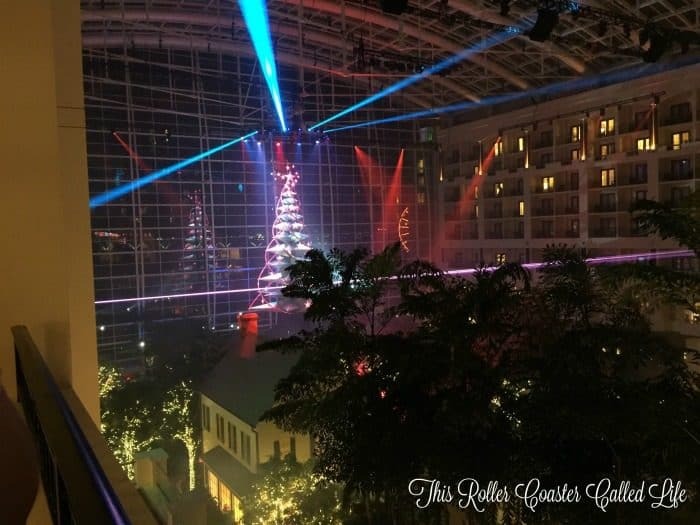 During the holidays, Gaylord National Resort & Convention Center has two different holiday light laser shows in the atrium. Before the first show started, Marvel Boy took Duffy and his new stormtrooper bear out to get settled in a chair and wait for the show. Here is a view of the show from our balcony. 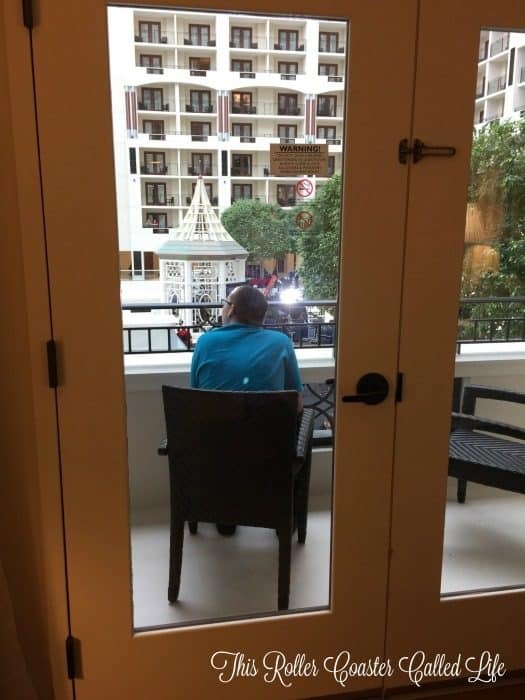 The balcony provided Marvel Boy a “safe space” to view the show from, and he really enjoyed the show much better than if he had been down with everyone else in the atrium. Here is a view of one of the holiday laser light shows from the atrium near the fountain. We saw both shows and enjoyed them both! 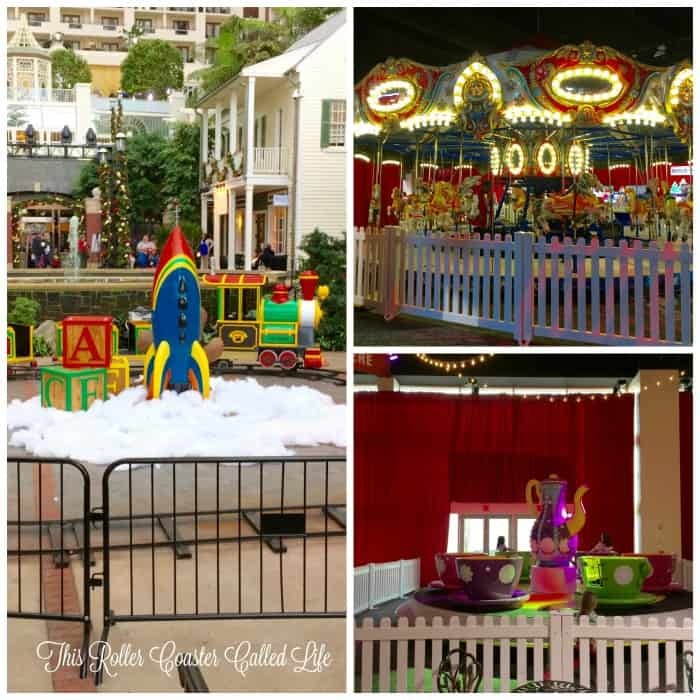 Christmas on the Potomac at Gaylord National Resort & Convention Center truly provided a full day of fun things to do for the holidays! If you would like to see ICE! 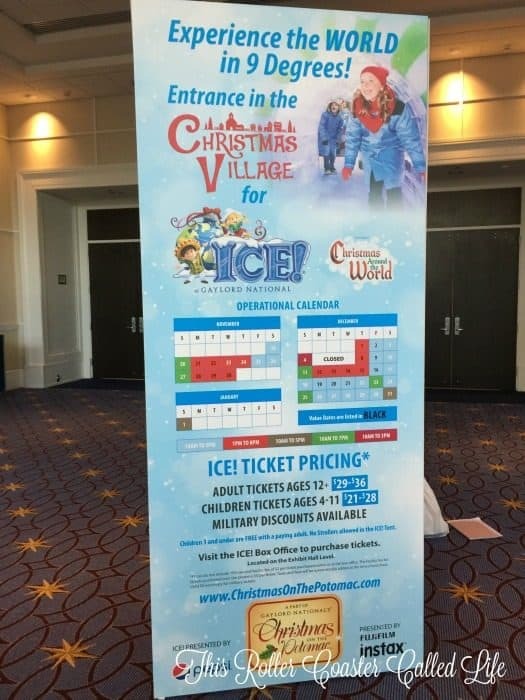 at Gaylord National Resort & Convention Center, there is still time! It is open daily through Jan 1, 2017. 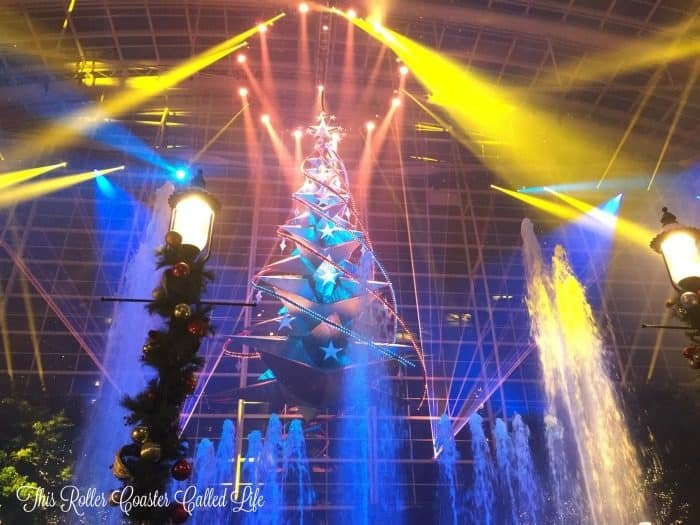 Make sure to check out all the Christmas information on the Gaylord National website! 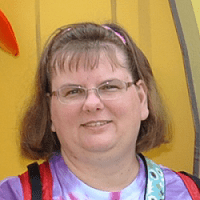 Disclosure: My kids and I received free lodging and tickets for the activities that we took part in. Having said that, all opinions are our own and not influenced by comps. What an amazing ‘field trip’! Everything looked so exciting and fun. 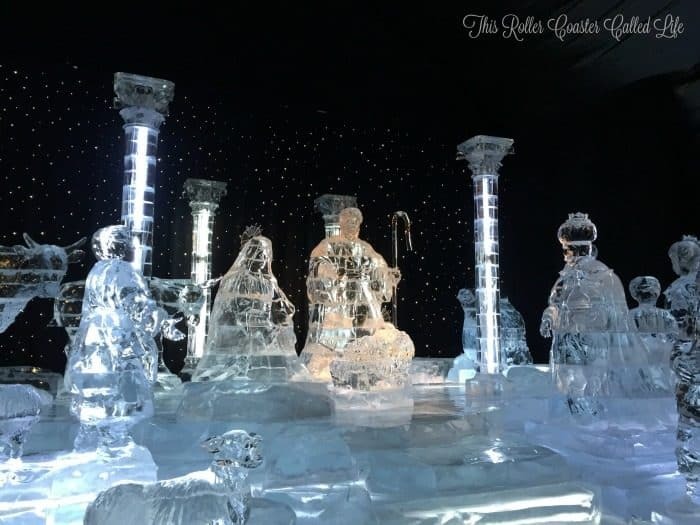 I love The ice Nativity seen, my grandchildren would have flipped over so much of it. 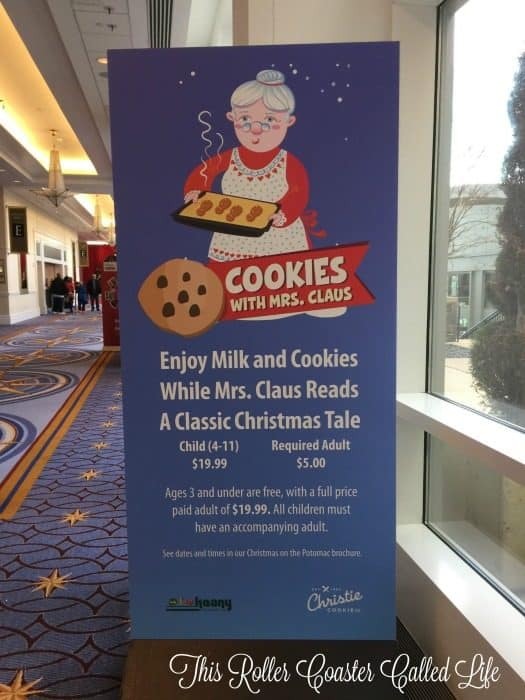 The cookies and story with Mrs. Claus, the Christmas festivities – I’ll have to tell my daughter and son-in-law. Surely an amazing experience! I got goosebumps while looking at the pictures and reading your post! I would love to attend some day and experience this first hand ~ just BEAUTIFUL! 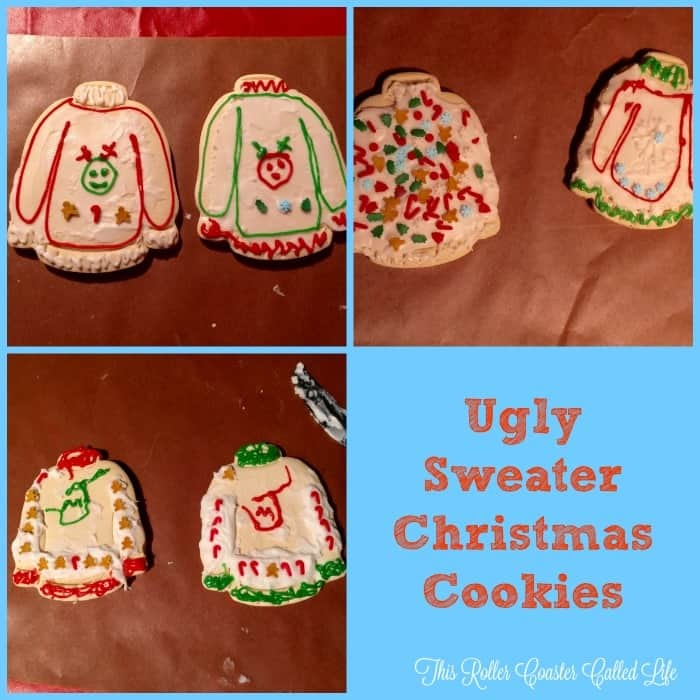 This looks so festive! It would make for a great annual tradition! National Harbor Gaylord is a wonderful place. We go there several times a year. Visited one of my best friends while completing her Master’s Degree in that area. I wish this had been there when we were there! Looks like a blast! There are so many things to do in Washington DC that are fun and educational. I wasn’t even aware of this. Seeing ICE! sounds like a delightful family adventure. I know you had fun. Thank you for sharing this. This venue is not too far from me and I’ve often wondered exactly what it was like. Now I know! Thank you! I was not aware of this being in Washington DC! It looks like so much to do and see. I would need a couple weeks. 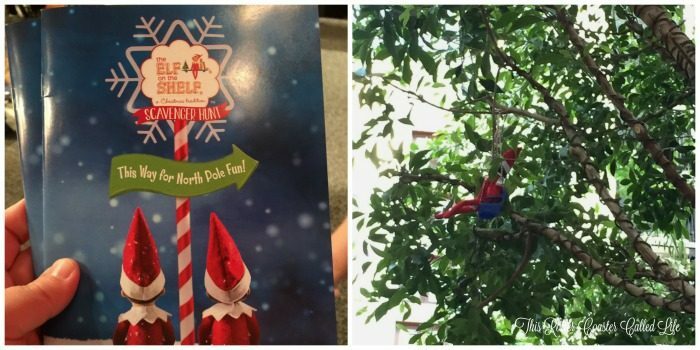 Looks like a fun place to take the kids for the day, would definitely get the family in the Christmas spirit. This looks like a fabulous place. I love the Ice sculptures. 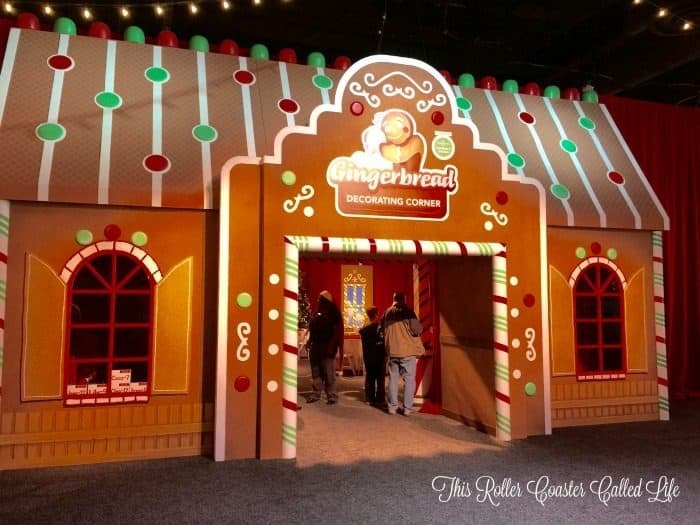 This would be so much fun to visit during Christmas. Living in South Carolina, I don’t really get to experience the cold, so it would probably be a great shock to me. But, everything looked so pretty and festive. Wow! What an amazing place! From the quiet beauty of the nativity to the colorful Christmas villages and shopping, there is so much to do and see. I bet it really brings out the kid in you. My sister in law’s family stayed at that hotel a few summers ago and raved about it! This looks like a great place to spend Christmas. I had never even heard of the Gaylord by Marriott. This place looks awesome! The ICE event looks so fun! I know you guys had to have had a blast! I have never heard of this. What a beautiful place to get into the Christmas Spirit. 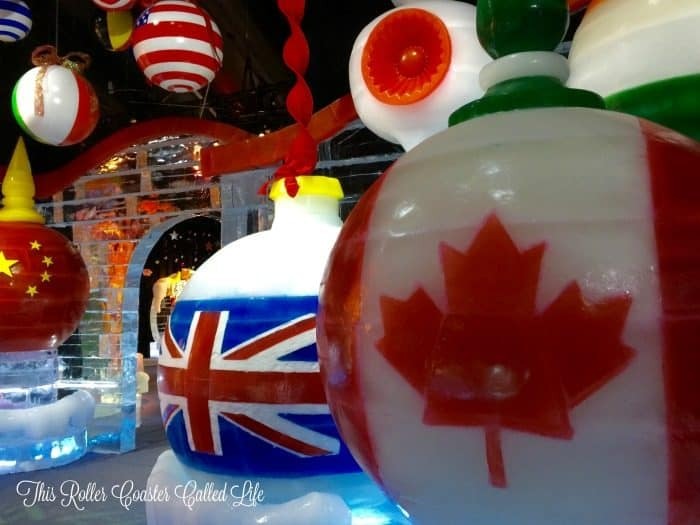 Love the Christmas around the World scenes. Pictures are so eye opening I really need to learn how to enjoy the people and things that surround me each day. We go the Gaylord several times a year for cheer competitions and their Christmas events are outstanding! 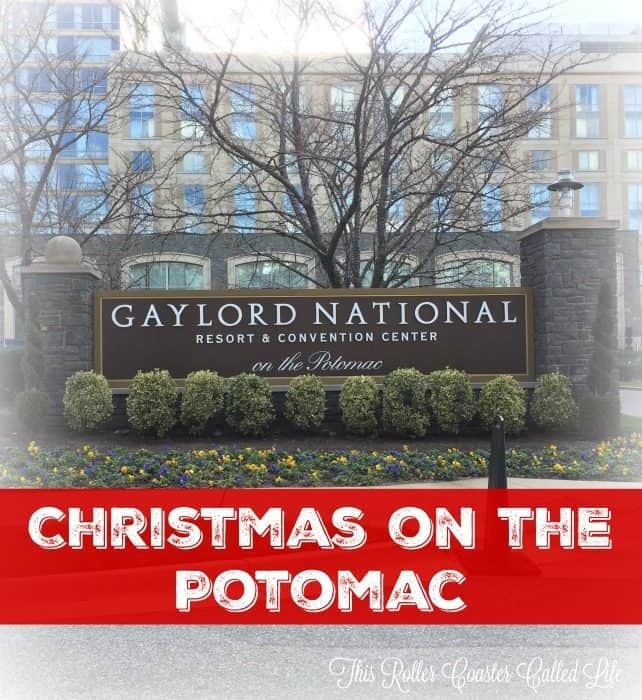 This trip to Gaylord National Resort is definitely on my bucket list. No excuse for not checking it out sooner as I live very close. Thanks for reminding me!